The Back Story: Sparkle, a Chris-Craft Catalina (Hull # DC-48-22), was number 22 of 24 built by Chris-Craft Industries in Algonac, Michigan. The original owner was president of Pomona Tile Co., who ordered a custom configuration of galley aft, guest quarters forward, and Chris-Craft option of three engines, according to Christine Rohde, Sparkle’s current owner. A welcomed project: Rohde purchased the classic yacht on April 2, 1999 as a present to herself. What’s in a name: She was originally named Kantana II, but my Rohde renamed the boat after the nickname her father gave her years ago – Sparkle. Famous Skippers who have been Aboard: Rohde notes Sparkle was berthed in Marina del Rey in the late ’70s and ’80s with famous owners running the gamut from Elton John, and Clint Eastwood to Donald Sutherland. Recent Restorations: Sparkle is about 90 percent original inside and out. The original three Chris Craft engines were removed in the ’70s and Rohde repowered her with twin Chevy 454XL engines in 2001, along with new exhausts, fuel tanks, all new electrical systems, and other related items. 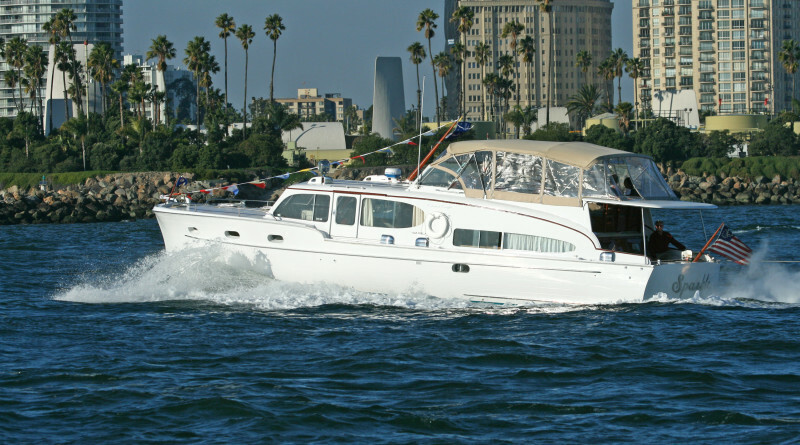 Recent Notes: “I’ve lived aboard since I purchased her, and can’t image being on land again,” said Rohde, adding, she shows the boat off to the public during Classic Yacht Association shows and Old Fashioned Day in the Park in Marina del Rey. Where currently berthed: Marina del Rey.